Another wonderfully weird book from Ronson, who seems to specialize in examining the oddness that lurks in the corners of everyday life. I did find the book a little disjointed, as he bounces from the mysterious package that begins the book, to Scientology, to the Hare checklist, to LSD treatments for pyschopaths in the 60s, to what makes madness compelling to a modern audience, and many more places--they're all loosely connected and he makes all of them interesting, but it just sort of whetted my appetite for more information. 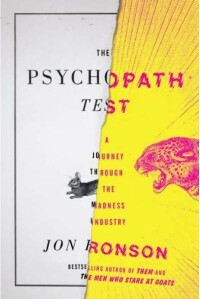 For example, Bob Hare's theory that psychopaths are over-represented in the upper reaches of politics, business, and religion is fascinating and I will definitely be picking up Mr. Hare's book on that for more information, since Ronson just briefly touches on it (although he does visit an imprisoned former death squad leader and a captain of industry who enjoyed firing people). Overall, though, it's another good read from Ronson that will make you laugh while it freaks you out.